This tangerine sunburst orange monster took many people by surprise at the ZookiMelt this year. 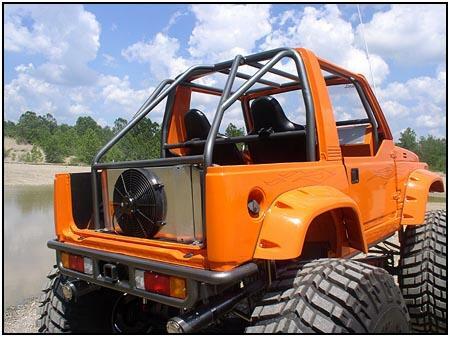 Many had seen it on the internet and dubbed it a 'show truck' (myself included). 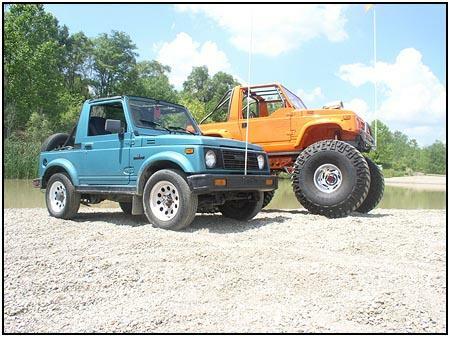 But owner Brian Nelson of Rochester, Indiana showed everyone that this 87 Samurai had the 'Go' to match the 'Show' when he headed for the green trail in the Badlands Offroad Park. It was impressive. But let's take a closer look at how this full bodied Zook was put together. 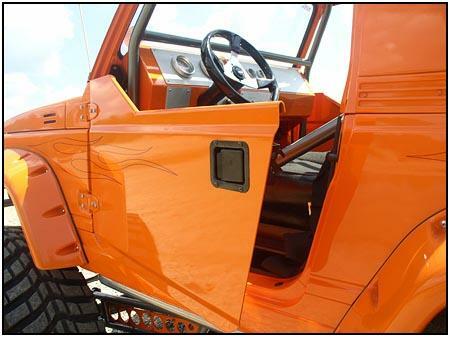 The Warrior half doors and the Bushwacker fender flairs were painted the body color to provide a smooth flow. They blended into the overall look as if they were factory options. 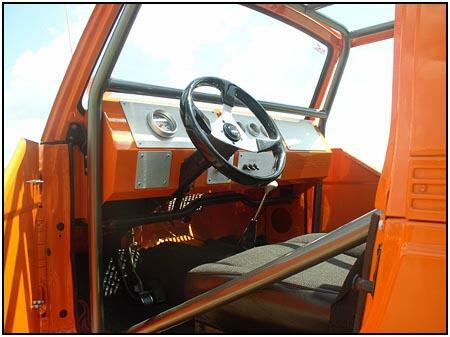 Going inside we see a Petroworks custom dash loaded with a full set of Autometer Ultra-lite gauges. 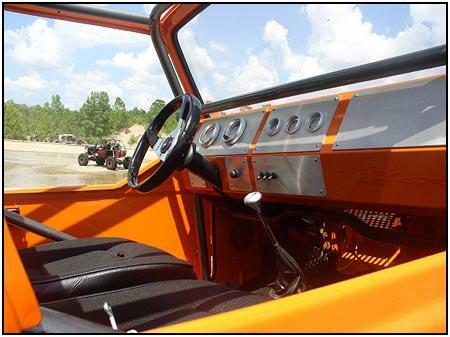 The Roadster seats and 4 point safety harnesses are from PRP. 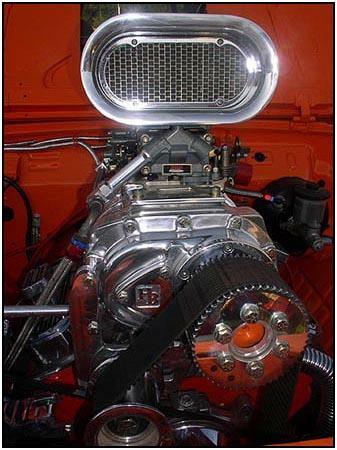 The 1.5" HREW cage terminates out back to form a perfect mounting frame for the relocated radiator. 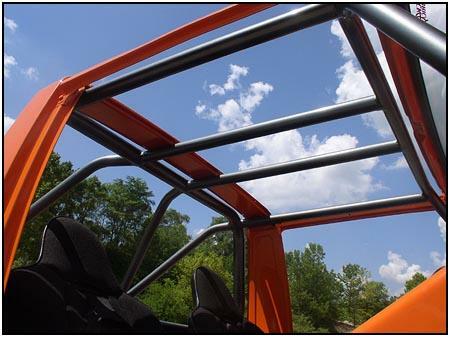 The six point roll cage, door bars and safety harness mounts were done by Rock 4xFabrication, as was the one-off 3 link suspension system. 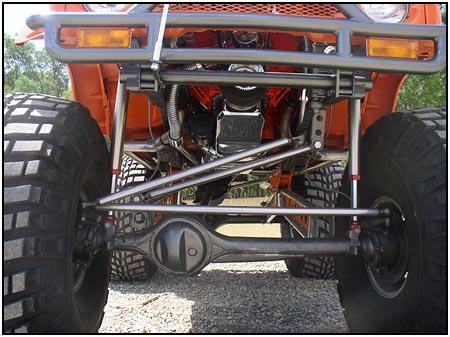 It incorporates 14" Sway Away shocks, custom shock mounts and 3/4" chromoly heim joints at the frame and 35" links. 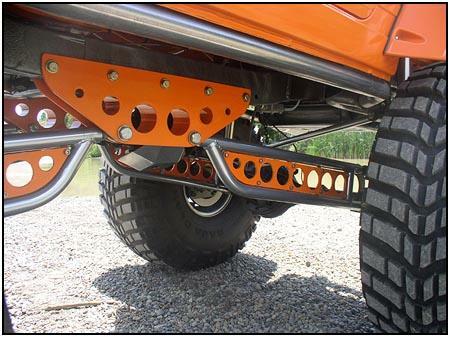 Rock 4xFabrication put in over 226 hours in the design, fabrication and installation of the suspension. 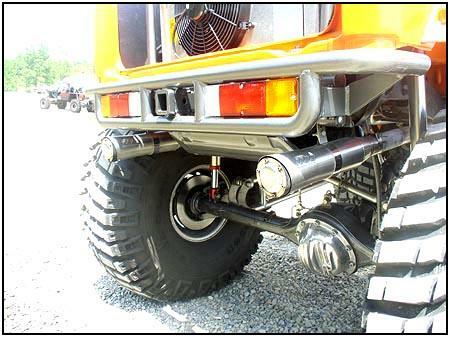 Brians ride combines an 82 Toyota mini truck front axle and an FJ60 Land Cruiser rear axle stuffed with 4.10 gears. The transfer case (amazingly) is still running stock gears, but it is being protected by a Do It Yourself (DIY) T-Case Bucket that was massaged into a dropped position to provide a bit more clearance. Brian also opted for front and rear Trail Tough bumpers. 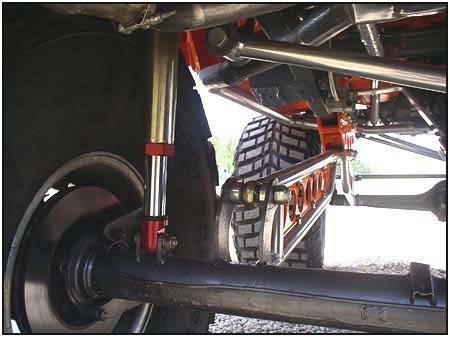 Now we get to the main reason this vehicle has the power to turn those 46/19.5/15 Mickey Thompson Baja Claws. 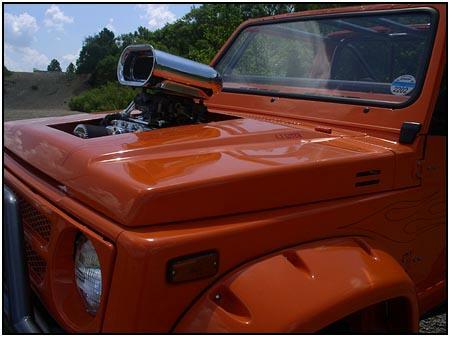 The stock power plant has been replaced with a 4.3ltr Chevy V6 bolted to a TH200M transmission, topped off with a Don Hampton 4/71 Blower. 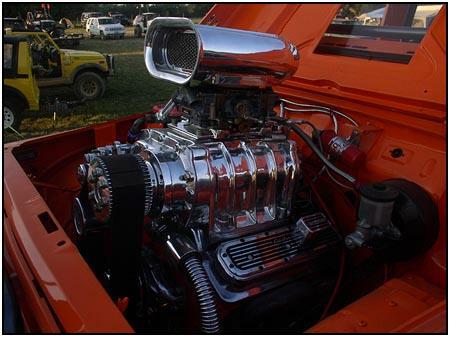 The Pro Billet distributor feeds an MSD 6a ignition system. 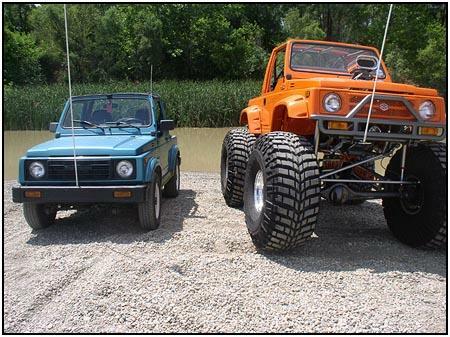 Just for a good comparison, we parked this bone stock Samurai next to the orange behemoth. What a difference. The 27" of overall lift makes this a real monster.